A father, who accompanied his son for the NEET in Kochi, passed away soon after his son left to his exam centre. S Krishnaswamy, 46, a librarian at Thiruvarur, had come to the city along with his son Kasturi Mahalingam, who was taking the pan-India medical entrance examination at the Nalanda Public school at Thammanam here. The came from Thiruvarur on Saturday and were staying at a city lodge managed by a relative. According to reports, as the father was feeling uneasy on Sunday morning the relative who ran the lodge dropped Kasturi at the examination centre. He then took Krishnaswamy to the hospital around 8.00 am, but the man succumbed to heart attack shortly thereafter. Kasturi, meanwhile, wrote the examination unaware of his father’s demise. He was picked up by the police when he exited the examination centre at 1.30 pm and was taken to the hospital. Ernakulam collector Mohammed Safirulla said that the body will be taken to Thiruvarur in an ambulance on Sunday and the police will accompany the body till the state border. The revenue officials will stay with the grieving family till they reach Thriuvarur. Meanwhile, Tamil Nadu chief minister K Palaniswami conveyed his condolence to the kin of the deceased and announced a solatium of Rs 3 lakh from the CM’s Public Relief Fund. Expressing anguish over the incident, Palaniswami said a team of officials has been rushed to the neighbouring state to bring back the body. 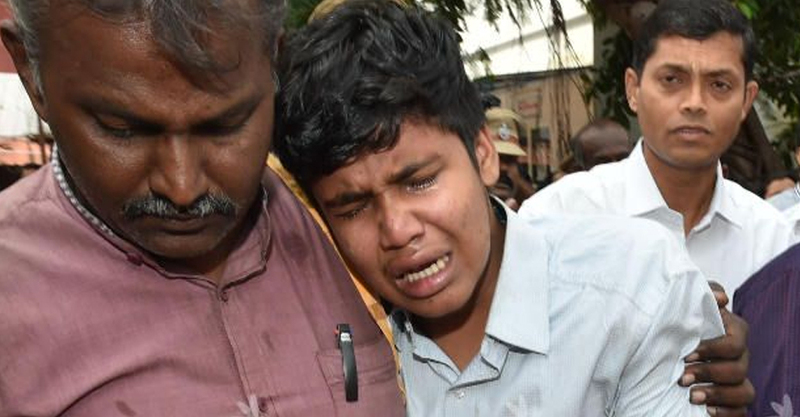 “I have sent a team of Tamil Nadu officials to Ernakulam to assist Kasturi Mahalingam to take his father’s body home after he completes writing NEET exam,” the chief minister said.